Josh Lilley is thrilled to present the grouping of 4 Painters 10 Works; featuring Hurvin Anderson, Nick Goss, Norbert Schwontkowski, and Ryan Mosley. Developed out of conversations with some of the artists involved, the exhibition aims not to be thematically prescrip- tive. Instead it offers a small but focused slice from a strata of painting today, providing an unashamedly emotional antidote to the often formulaic style in which the medium has been associated in recent times. 4 Painters 10 Works proposes a presentation of four artists who have determined styles uniquely their own; the way in which Anderson's surfaces evoke a psychological state of mind in his paintings, dealing with the possibilities of paint - but also with the intermingling of memory, colonialism and immigration; of how Nick Goss plays with the absence of resolution in his work - providing the implication that they may once have had considerably more visual information - which has subsequently been removed, washed or scraped away; the way Schwontkowski imbues the figures and simple representational elements in his paintings with a sort of infinity, allowing them to survive in a mel- ancholy existence that reflects our everyday hostile world; and finally Mosley's transgressive characters that allow for escapism to be totally indulged. A potent and theatrical painting style that manages to evade a sense of time - as well as the boundaries between real and imagined space. Yet all four artists have moments where their works converge and come together; where their sensibilities, layering of information, and projected displacement find relevance in each other's company. 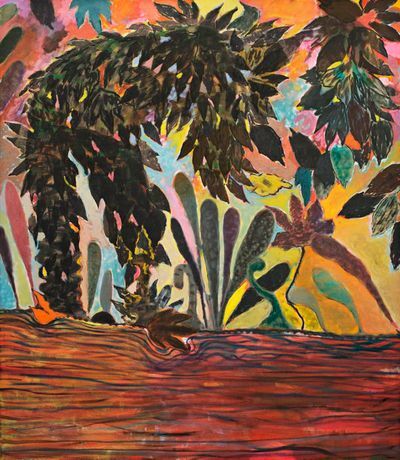 Meandering through the paint- ings on display one sees floral elements and foliage in both the works of Goss and Mosley upstairs. The pale and paired back tone of Goss is countered by the heat and vivid colours in Mosley - where the temperature is turned up dramatically. This pulsing energy is shared by Anderson, while the interest in interior spaces, or exploring the inside and outside - is taken up by all four artists. Residual traces of human presence, or the implication of post-event, are also apparent throughout the works; where screening devices to create barriers join veiling and layering techniques - creating images between images between images. A bird cage in a Turkish barber shop was the inspiration for Goss's silkscreen pattern that runs down most of his works in the show. It becomes a textured division - much more subtle than in some of Anderson's earlier fence or grille paintings. Anderson's own stylised closeup of one of his barber shop walls takes the form of geometric abstrac- tion in the exhibition, while the more lyrical elements in Mosley and Schwontkowski provoke the same question from the viewer; how to determine one's own role, position, and importance in unravelling the information and imagery in front of you.